Count on comfort and convenience at Courtyard Orlando Airport, which offers an array of modern amenities for today's traveler. 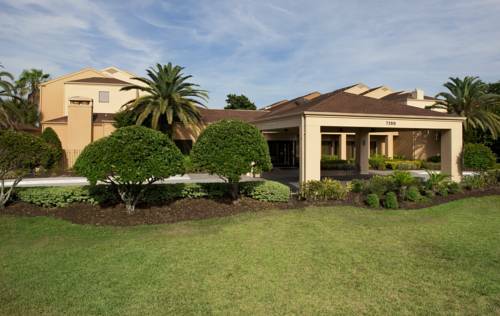 Located near Orlando International Airport, we provide complimentary shuttle service to the nearby transportation hub. Upon arrival at our hotel, enter into a state-of-the-art lobby with room to relax, work and dine in style. Grab a bite to eat at The Bistro, open for breakfast and dinner. During downtime, relax over cocktails on the patio, take a dip in the outdoor swimming pool or stay fit in our exercise room with 24/7 access for guests. Business travelers will appreciate our on-site event spaces and full-service business center, equipping you to print, copy and fax with ease. At the end of the day, return to well-appointed rooms with complimentary wireless internet access, plush Marriott bedding and balconies, perfect for breathing in some fresh Florida air. Whatever brings you to the Sunshine State, book today at one of the area's premier airport hotels. The Bistro - Eat. Drink. Connect. is your destination for refreshing breakfast choices and hearty lunch and dinner options. We offer specialty Starbucks drinks to help you get a jump on the day. Cocktails and beer at night are perfect for winding down.